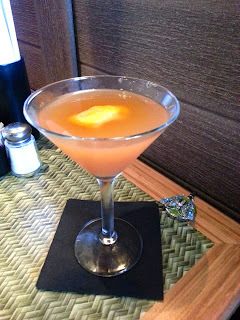 This afternoon, my husband and I decided to try Happy Hour at the fairly new Elephant Bar in Northridge, CA. It was pretty dead when we arrived around 4pm. We chose a table on the patio area that's connected to the bar. There was only one other table occupied out on the patio. It was nice and relaxing. There were TVs both inside the bar and out on the patio, but the volume was either turned way down or off which I appreciated. I don't like the sports bar feel restaurants tend to get when the TVs are too loud. Our waitress came over with full menus, but we ended up just ordering off of the Happy Hour specials. To start, while we looked over the menu, I decided to take advantage of the all-day Tuesday special of half-price Skinny Cocktails. I ordered the Skinny Snap Dragon Martini. It contains Dragon Fruit Skyy vodka, passion fruit puree, cranberry juice and a pinch of cayenne. I was not disappointed. After visiting Maui, I've really grown to appreciate the passion fruit flavor, and the cayenne gave it just a hint of spice, a nice kick. It was really a great combination. The menu had pictures of most of the items on the Happy Hour menu, so I used that reference to help decide what to order. 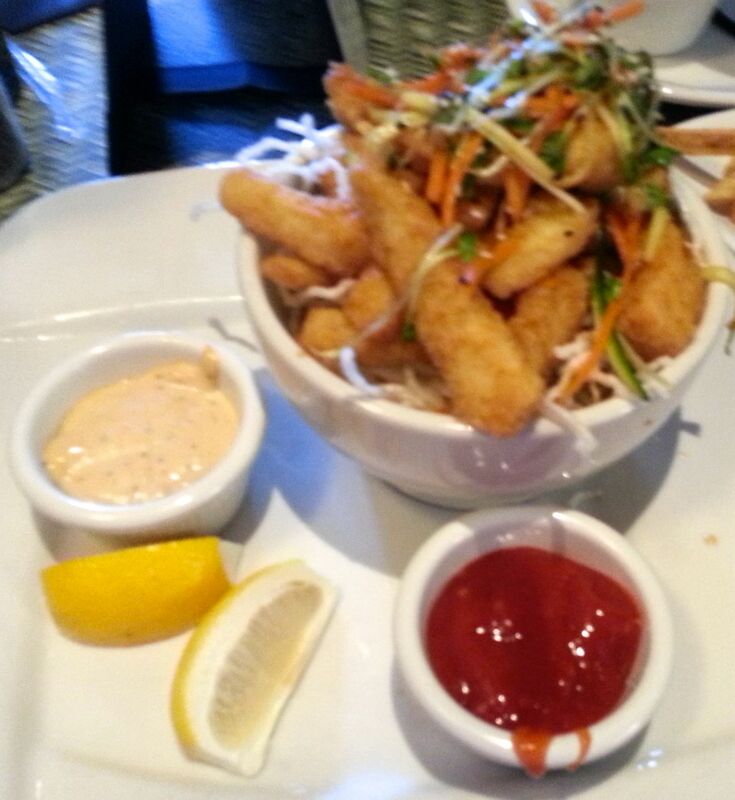 In the end, I chose Coconut Shrimp Skewers and Sweet Potato Fries. They both tasted like "dessert," which to me means they were pretty sweet. 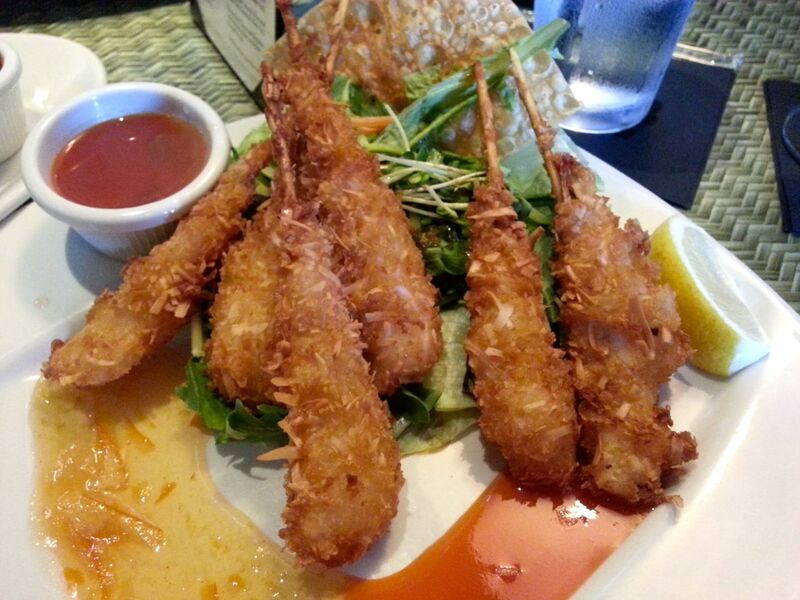 The coconut shrimp skewers were bigger than I expected. It's a good thing my husband was there to help me eat them. He usually doesn't like the texture of coconut, but with the batter, he actually enjoyed the flavor. 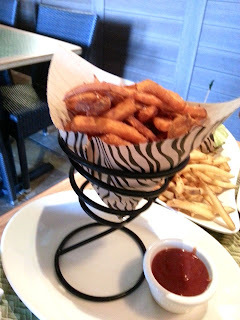 I really loved the sweet potato fries. They came with Szechwan chili-spiked ketchup. Our waitress also brought out a bottle of Heinz. When it comes to ketchup, I always prefer Heinz. In my opinion, that's what ketchup is supposed to taste like. The Szechwan ketchup wasn't bad though, especially considering that a lot of the food at the Elephant Bar has Asian flavor. In the end, I ate the fries without dipping them in anything. They were just that good. 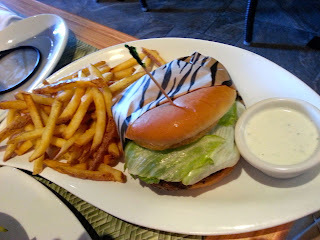 My husband ordered the Quick-Fried Soy-Ginger Calamari and the Classic "Big E" Burger and French Fries. The calamari was thick and juicy, but it wasn't as crisp as I would prefer. It was okay, but we probably wouldn't order it again. As far as the burger goes, to quote my husband, "That's probably the best burger you'll ever get for $5.50." That's right folks, a 1/2 lb burger and a generous serving of fries for only $5.50 during Happy Hour. That's less than you'd pay at your favorite fast food chain. I took a couple bites, and I was impressed with the flavor. I'll probably order the burger next time. The fries were good, but I'd probably upgrade to sweet potato fries. We looked at the dessert menu, but we were too full to really consider ordering dessert. Maybe next time.